Ever since news first broke that Anne-Marie Curtis was to take over the reins at British ELLE, our forums have been keeping a very close eye on the title. To kick-start her promotion from fashion director, Curtis embraced diversity for August and received a round of applause on our forums. She now cements her status as editor-in-chief by ushering in a whole new look for the magazine with the help of model-turned-actress Cara Delevingne as cover girl for September 2017. 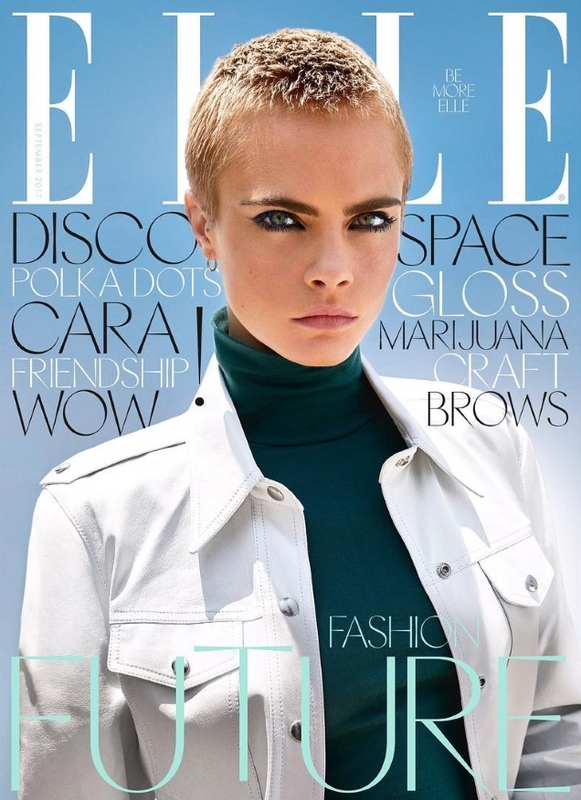 Shot by Kai Z Feng, Delevingne stars on two striking covers, wearing Calvin Klein on one (below) and Chanel (for which she is the face of this season) on the other (after the jump). ELLE‘s new look was bound to receive attention from our forum members. “Wow, thumbs up from me!!! The revamp, that is. It looks unlike anything on the newsstand and not very British at all. Very modern. And the styling looks stunning as well. It’s just Cara with her awful hair which I’m not sold on,” stated Benn98. “Romeo Beckham already getting covers? He looks great. Jokes aside, actually really like these. She works it, and her PR should get a raise she is getting tons of covers, despite another flop movie!” Miss Dalloway noted. “I love the layout but what the hell are those cover lines?” asked Style Savvy. “Love the layout, especially the font and Cara’s new look and the styling work perfectly for the theme. I love it, love it, love it,” exclaimed a delighted kokobombon. “I like it. Very fresh. The layout is a hit for me. I like it here. However, the only issue I have is, is this a layout that is flexible enough? Surely it works here, but what if it’s an outdoor shot with a busy street as the background? Is it not too thin that it would disappear?” quizzed MON, wondering how this redesign might transcend onto other covers. Await more from the issue and join the conversation here.